Using WP Fusion and LifterLMS, you can automatically save contact details to your CRM when a student purchases or registers for a course or membership. You can also automatically apply tags based on what was purchased, and track student progress. 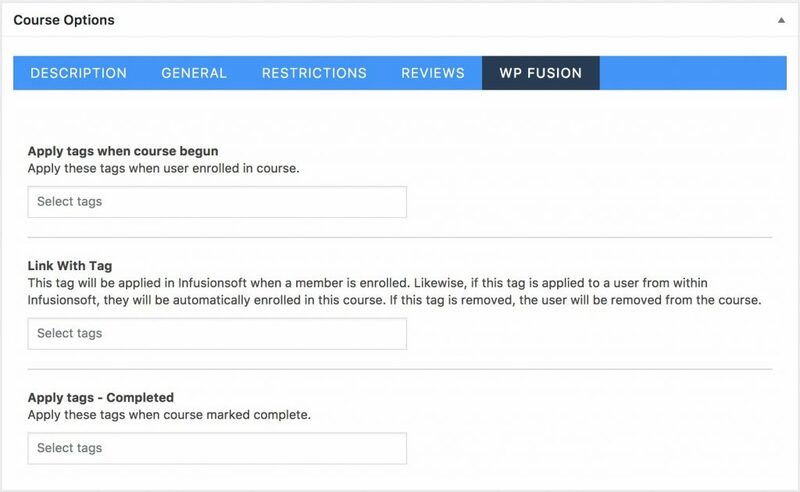 Under the course settings for WP Fusion, there are three options: Apply tags when course begun, Link with Tag, and Apply Tags – Completed. Linking a course with a tag lets you automatically enroll a user in a course via an automation in your CRM. By applying a tag in your CRM and sending a Webhook or HTTP Post, the user will automatically be enrolled in the course. If this tag is removed, the user will be unenrolled from the course. The settings area for lessons in similar, but only provides the option to apply tags when a lesson is marked complete. 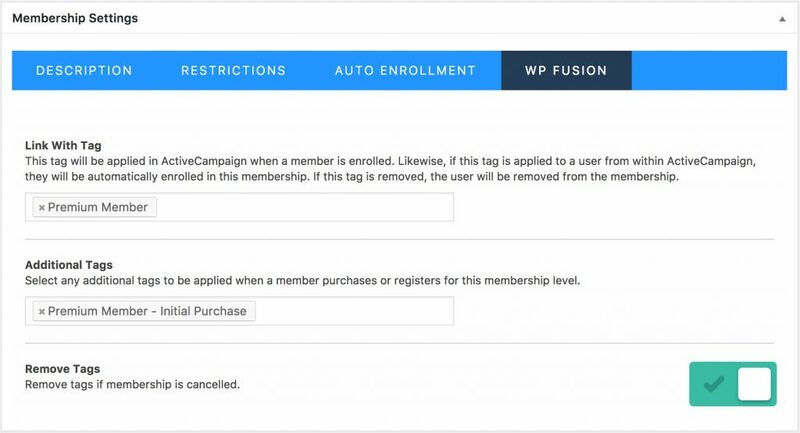 WP Fusion also supports applying tags to a user when they are added to a membership level. You can configure this from the new WP Fusion tab added to the LifterLMS membership settings page. There are three options, Link with Tag, Additional Tags, and Remove Tags. Linking a membership with a tag lets you automatically set a membership level via an automation in your CRM. By applying a tag in your CRM (“Premium Member” in the example above) and sending a Webhook or HTTP Post, the user will automatically be added to the membership level. If this tag is removed, the user will be removed from the membership level. Additional Tags are tags that will be applied one-time when a user first purchases or registers for the membership level. You can use these to track and engage with new customers. Remove Tags will automatically remove the tags above if the membership is cancelled or a student is removed from the membership. WP Fusion also allows you to associate tags with LifterLMS Access Plans, so you can tag students based on how they signed up for your courses. The settings for WP Fusion appear above the Description field when editing an Access Plan. These tags will be applied to a student when they purchase a plan, or sign up for a free plan. WP Fusion supports applying tags when a quiz is attempted in LifterLMS, and when a quiz is passed. To set this up, expand the WP Fusion section while editing any quiz. The Quiz Attempted tags will be applied whenever the quiz is attempted. The Quiz Passed tags will only be applied if the student receives a passing grade.